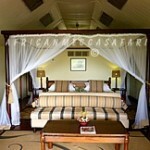 Savute Elephant Camp offers an oasis type setting in complete luxury. 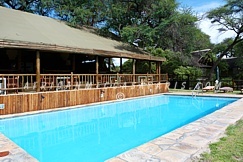 All 12 luxury tents are housed on raised wooden platforms, offering great views, and shaded by a traditional African thatch roof. 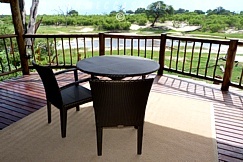 The large private decks are furnished with easy chairs and a hammock, ideal for viewing wildlife, or for enjoying a private dinner in complete privacy. 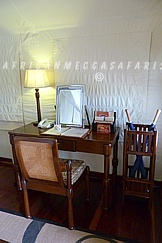 The tent interiors are luxuriously appointed with such comforts as an en suite bathroom, private fully stocked mini bar, four poster bed complete with mosquito netting, as well as a discreet air conditioning. 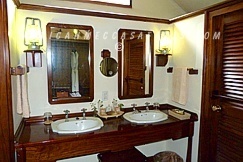 The twin-bedded luxury canvas tents, recently placed under thatch, that are perfectly suited to the desert air feature lavishly appointed en suite bathrooms and dressing areas. 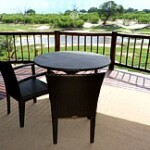 They also have private viewing decks and comfortable outdoor lounges overlooking the Channel. 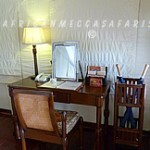 For your convenience, in-room safes are provided for the safekeeping of all cash, travel documents and other articles. 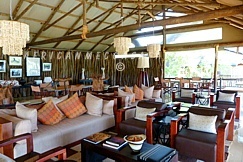 At Savute Elephant Camp, you will enjoy a relaxed meal overlooking the stunning Savute channel in its raised restaurant. Gazing over the channel which is home to one of Africa’s largest elephant population, you will be treated to delicious cuisine created by our skilled in house chefs.Through out the day you will be able to relax is in the quiet atmosphere of the lounge sampling exotic treats or simply sitting back with a cup of tea taking in the remote landscape. 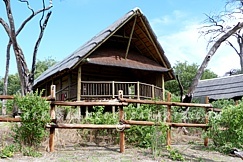 The camps skilled chefs are always on hand to prepare light meals or snacks for the game drives through the Chobe National park. 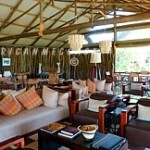 In the evenings we will prepare the camp fire and let you experience a sky un tainted by unnatural light. 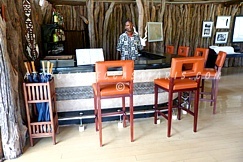 Of course we also have a full stocked bar that is available at your convenience. 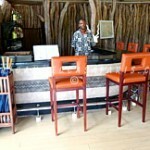 You can now dine in style in the middle of the bush as your guide serves breakfast or dinner in the open air. 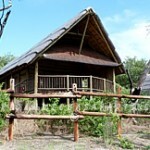 Savute Elephant Camp is located In the south west of Chobe National Park. 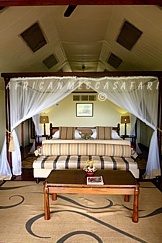 It lies on a dynamic wilderness, a sweeping expanse of savannah brooded over by several rocky outcrops which guard a relic Savute marsh and the Savute channel. Mysterious wet and dry cycles mould this landscape and dictate the nature of its wild inhabitants. 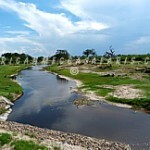 The Savute Channel, one of the greatest mysteries and fascinations of Northern Botswana, is flowing again after nearly 30 years of lying dormant. 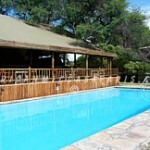 The Gubatsa Hills shelter leopard and Klipspringer and rock paintings of early man’s wildlife sightings. The park is best known for the high concentration of elephant population, with over 50,000 it is the largest elephant concentration in Africa. 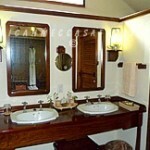 The elephants are formed of the species called Kalahari Elephants. These elephants are characterized by there larger than average size but comparatively weak tusks. 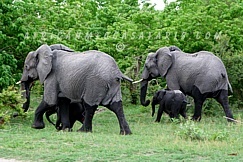 Dry season game viewing concentrates on Savute’s resident bull elephants as well as antelope and lion prides around half-empty pans and permanent water-holes. 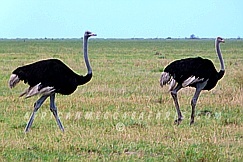 Black-backed jackal, bat-eared foxes, tsessebe, kudu, impala and ostrich abound. The summer rains bring a feast for lion, hyena and cheetah as thousands of migrating zebra and wildebeest assemble in a chaotic pattern on the Savute marsh. Cape buffalo herds arrive and migrant birds swell Savute’s 300 resident species, thrilling bird-watchers with their spectacular antics. Carmine bee-eaters perch on the back of kori bustards and red-crested korhaans plummet from the sky in daring aerobatic mating displays. 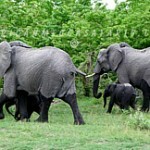 Game Drives – Early morning game drives take you out and among Africa’s largest populations of elephants. Big cats are on the prowl, too—from leopards to lions. Bushmen Paintings and Baobab Trees – Out in the bush, where rocks rear up among stony hills, are a collection of paintings that take your breath away. 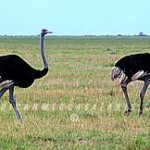 Bird Watching – Now is a fascinating time to spot birds here. 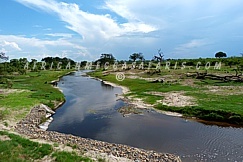 The intermittent Savute Channel, dry for 30 years, has recently started flowing past the camp again. With it has come a host of new species. Star Gazing – The open skies around Savute camp make it the perfect place to experience the vast, dark dome of the African night sky.